In a skillet, cook onion, garlic and thyme in olive oil until onions are softened and lightly browned. Slowly whisk in 1 cup of chicken broth, scraping up any brown bits from skillet, then transfer to slow cooker. 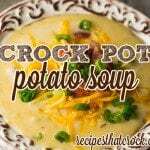 This recipe does great in any 6 qt slow cooker. However, since this soup has a precooking step and because it has a cream and cheese base, we recommend this stove top safe slow cooker that has a great non-stick surface. The crock can go straight from the browning step on the stove into the slow cooker unit without dirtying another dish and the non-stick surface is perfect for cream based cheesiness that tends to stick in other slow cookers. This recipe is altered from a soup we found in America’s Test Kitchen’s Slow Cooker Revolution .